What you eat matters. Something as simple as eating more fruits and vegetables each day can trigger a cascade of health benefits — a really healthy foods diet similar to the Mediterranean diet rich in fruits, veggies, nuts, legumes, healthy fats and healthy carbohydrate alternatives, has been proven to protect both the body and the brain from illness, even preventing depression. Happiness and a long life — who could ask for more? But what if your body isn’t fully equipped to absorb the nutrient-rich fruits and vegetables that you eat? For many of us, the promise of a full and fulfilling life remains just out of our reach because we aren’t able to digest the healthy foods we eat. 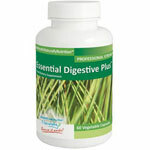 Unfortunately, digestive enzymes in the body decrease with age. And with each passing year, your digestive system may be less able to break down, absorb and utilise the nutrients in the fresh foods you eat, unless it receives outside help. Specific enzymes released in the digestive process have their own unique jobs. If you have noticed that your digestion has slowed down with age, as digestive enzymes naturally start to decrease, you may find it harder to digest protein, fat and carbohydrates than it was only years ago. This is a newly formulated professional strength enzyme complex combining the power of all the important digestive enzymes with Fruta-Fit@ Inulin. Contains the Lactase enzyme which improves lactose digestion in individuals who have difficulty digesting lactose and now comes with Peptidase and Protease for improved gluten digestion. Take with every meal. Three main digestive enzymes are released by the pancreas to help break down food that enters the small intestine: protease to digest protein, lipase to digest fat and amylase to digest carbohydrates. A full spectrum of digestive enzymes is important to take at each meal to give the body an extra digestive boost for proper breakdown and absorption. With your health hanging in the balance and your happiness on the line, more efficient digestion may be the answer you have been looking for all along. Even eating the healthiest diet may not be enough if you are not able to digest and absorb the foods you eat. 1. Fruit and veggies give you the feel-good factor 2016. University of Warwick. Thomas, E and Frost S 2015 randomized controlled trial; the effect of inulin on weight management and ectopicfat in subjects with prediabetes. Nutrition & Metabolism. 12:36. doi:10.1186/s12986-015-0033-2.